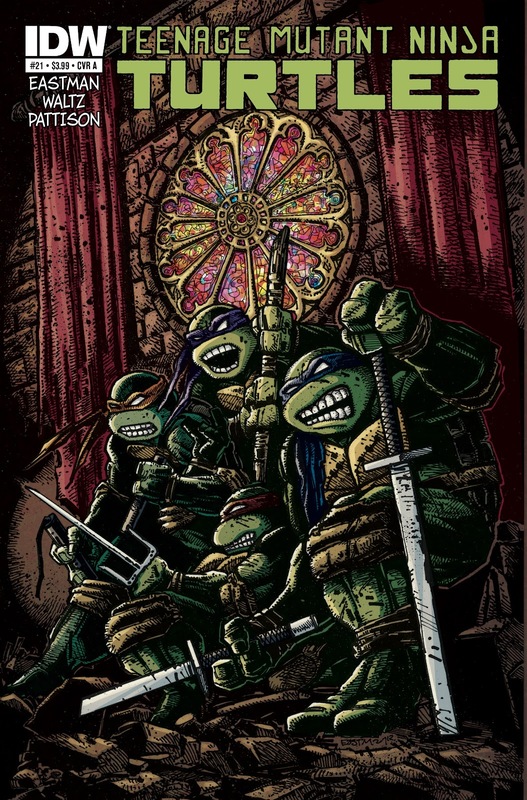 The Fellowship was fortunate enough to obtain a copy of TEENAGE MUTANT NINJA TURTLES #21 from IDW Publishing. The story and art is by Kevin Eastman, script by Tom Waltz, colors by Ronda Pattison, and lettering by Shawn Lee. The Turtles inspect the New York skyline after finishing their training for the night. They notice the city seems to be on edge, more tense than normal. Then the boys were attacked by a mysterious person who easily defeats them and disappears. Our heroes follow their attacker and are roundly defeated again and again. Who is this mysterious person and how does he know Splinter? Meanwhile, Shredder has found what he’s been searching for… that cannot be a good thing for our heroes. TEENAGE MUTANT NINJA TURTLES #21 is in stores now or available at www.idwpublishing.com.